Nearly 1,000 cancer researchers, RNA biologists, and clinical oncologists will convene to hear updates on the latest breakthroughs in the creation of RNA-based gene-editing tools and the development and intracellular delivery of RNA-cancer medicines. RNA therapeutics turn genes on and off, which provides the opportunity to treat a host of diseases caused by malfunctioning genes. While the process was initially challenging, promising early clinical results sparked a renaissance of the field and renewed optimism about the impact of RNA therapies. Members of the press are also invited to join Symposium chairs, Professors Phillip Sharp and Sangeeta Bhatia, Symposium speakers, and Koch Institute Director Tyler Jacks for lunch at Twenty Chimneys, Stratton Student Center, W20-306. All parties will be available for questions. 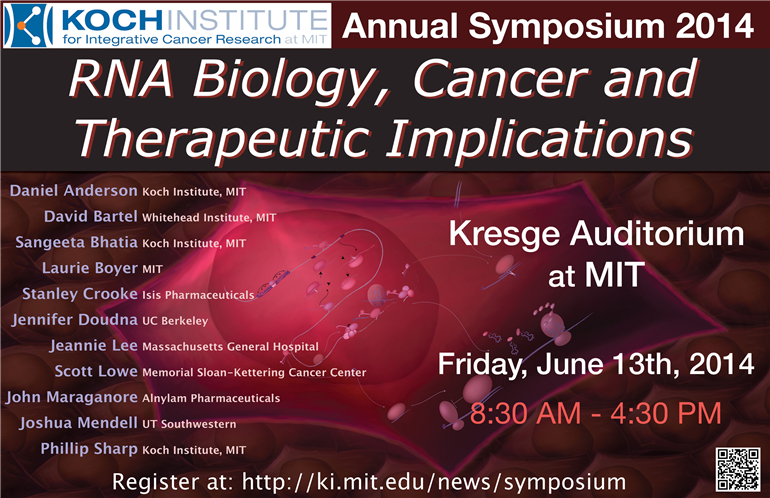 The 13th Annual Koch Institute Summer Symposium, “RNA Biology, Cancer and Therapeutic Implications,” will be held on Friday, June 13, 2014 at Kresge Auditorium at the MIT campus in Cambridge, Massachusetts. The symposium will help unravel the molecular and cellular mechanisms underlying RNA-based gene regulation in humans and provide updates on the latest breakthroughs and challenges in the development of RNA-based prognostic tools and therapies for cancer. “Novel microRNA functions in mammalian physiology and cancer”. Dr. Daniel G. Anderson is the Samuel A. Goldblith Professor of Applied Biology, Associate Professor, Chemical Engineering and Institute for Medical Engineering and Science, and member of the Koch Institute for Integrative Cancer Research at MIT. He received his PhD in molecular genetics from the University of California at Davis. At MIT, he pioneered the use of robotic methods for the development of smart biomaterials for drug delivery and medical devices. His work has led to the first methods rapid synthesis, formulation, analysis, and biological evaluation of large libraries of biomaterials for use in medical devices, cell therapy and drug delivery. In particular, the advanced drug delivery systems he has developed provide new methods for nanoparticulate drug delivery, non-viral gene therapy, siRNA delivery, and vaccines. His work has resulted in the publication of over 230 papers, patents and patent applications. These patents have led to a number of licenses to pharmaceutical, chemical and biotechnology companies, and a number of products that have been commercialized or are in clinical development. David Bartel received his PhD from Harvard in 1993 and has since headed a lab at the Whitehead Institute for Biomedical Research, where he is also an Investigator of the Howard Hughes Medical Institute and a Professor of Biology at MIT. His lab initially studied the ability of RNA to catalyze reactions and more recently has focused on microRNAs and other regulatory RNAs. Over the past 15 years his lab has contributed to the understanding of the genomics, biogenesis and regulatory targets of these RNAs, as well as the molecular and biological consequences of their actions in animals, plants and fungi. Dr. Bhatia trained at Brown, MIT, Harvard, and MGH. She was a faculty member of the Bioengineering Department at University of California at San Diego for 6 years. She and her 150+ trainees (29 graduate, 25 postgraduate, 100+ undergraduate) have published more than 130 manuscripts that have collectively accumulated over 11,000 citations. She is the co-founder of two biotechnology startup companies, holds over 40 issued or pending patents in tissue engineering, biomedical microsystems, and nanobiotechnology and has worked in industry at Pfizer, Genetics Institute, ICI Pharmaceuticals, and Organogenesis. She co-authored the first undergraduate text on tissue engineering, as well a white paper about ‘convergence’ in life, physical and engineering sciences, highlighting the need for cooperation amongst research, economic and policy experts to advance biomedicine and healthcare. She is a frequent advisor to governmental organizations on nanobiotechnology, biomedical microsystems, and tissue engineering. Dr. Bhatia has been recognized as one of the “the nation’s most promising young professors in science and engineering” by the David and Lucile Packard Foundation, one of the “100 most innovative young scientists worldwide” by MIT Technology Review, and has made top “Watch” lists at San Diego Magazine, The Scientist, andMass High Tech. Recently, she was named one of the “10 Most Influential Women in Biotech” by the Boston Globe. She received the NSF CAREER Award, the Global Indus Technovators Award, and Young Investigator Awards from the American Society of Mechanical Engineers, and the American College of Clinical Pharmacology. She is an elected Fellow of the Massachusetts Academy of Sciences, Biomedical Engineering Society, American Institute for Medical and Biological Engineering, and American Society for Clinical Investigation. Her work has been profiled broadly, such as in Scientific American and Popular Science, the Boston Globe, Forbes, PBS’s NOVA scienceNOW, Planet Green, and MSNBC. Laurie A. Boyer, PhD, received a doctorate in biochemistry from the University of Massachusetts Medical School in 2001. Her work with Craig Peterson focused on dissecting the biochemical mechanisms of chromatin remodeling enzymes. She then joined the laboratories of Rudolf Jaenisch and Rick Young at Whitehead Institute for Biomedical Research as a postdoctoral fellow. Dr. Boyer is a pioneer in the development of high-throughput platforms for genome wide analysis of transcription factor binding sites as well as histone modifications and chromatin regulators in stem cells. During her postdoctoral studies, she discovered how Oct4, Sox2, and Nanog comprise a core transcriptional regulatory network that controls embryonic stem cell (ESC) pluripotency. She also illuminated a key role for Polycomb group proteins in regulating cell fate decisions during ESC differentiation. In 2006, Dr. Boyer was recognized as one of the world’s 50 top leaders in research, business or policy by Scientific American for her innovative work in understanding the genome of human ESCs. In 2007, she joined the faculty at the Massachusetts Institute of Technology as an assistant professor in the Biology Department. Dr. Boyer’s lab investigates how chromatin structure influences gene expression programs and ultimately cell fate and how failure to establish proper chromatin states can contribute to disease. In addition, her research team is interested in the role of noncoding RNA as well as non coding DNA elements in fine-tuning transcriptional programs during cell fate transitions. Dr. Boyer is a Pew Scholar in the Biomedical Sciences and is the recipient of several early career awards including those from the Smith Family Foundation for Excellence in Biomedical Research as well as the Massachusetts Life Sciences Center. Chairman of the Board and Chief Executive Officer, Isis Pharmaceuticals, Inc.
Dr. Crooke is founder, chairman, and chief executive officer of Isis pharmaceuticals. During his tenure at Isis, he has led the scientific development of a new platform for drug discovery, antisense technology and engineered the creation of one of the largest and more advanced development pipelines in the biotechnology industry. Currently, Isis has more than 25 drugs in development including several drugs in phase 3 and a larger number in phase 2 clinical trials. Isis has reported broad progress in advancing the technology and has achieved commercialization of the first two antisense drugs to reach the market, Vitravene and KYNAMRO. KYNAMRO, recently approved, is the first systemically administered antisense drug to be approved and the first to be approved for lifelong treatment of a chronic disease, Homozygous Familial Hypercholesterolemia. Early in Dr. Crooke’s career, he led the creation of the first broad anticancer program in the industry at Bristol-Myers, bringing nine anticancer drugs to the market in the first five years of his career. He then assumed responsibility for worldwide R&D at SmithKline Beckman. While at SmithKline, he led the restructuring of the R&D organization and was involved in commercializing numerous new drugs in broad therapeutic areas. He also coordinated all research activities including, instruments and diagnostics. During his career, he has led the development of more than 20 marketed drugs. Dr. Crooke has also supported the creation and growth of a number of companies based on Isis technology including Alnylam, Regulus, Ibis, OncoGenex, ATL, and others. He led the creation of a large portfolio of strategic relationships, has served on numerous boards and is currently a member of the Board of Directors of BIO. Dr. Crooke was named by Nature Biotechnology as one of the most influential individuals biotechnology and has received a number of awards including the Director of the Year Award from the Corporate Directors Forum, the Distinguished Scientist Award from the American Chemical Society (San Diego Chapter), the Helix Award, for the most important innovation in biotechnology by the Biotechnology Industry Organization, BIO, Stony Brook University and the Center for Biotechnology, and the Ernst and Young and Entrepreneur Award of the Year Award as well as Distinguished Alumnus at Baylor College of Medicine and at Butler University. Dr. Crooke received his MD and PhD degrees and house staff training at Baylor College of Medicine and has been an active scientist throughout his career. He has led the creation of antisense technology broadly with a focused scientific interest in understanding the molecular mechanisms of antisense drugs. He has published more than 450 scientific publications, edited more than 20 books, and has numerous patents. Dr. Crooke has also been a medical educator and was a professor of pharmacology at Baylor College of Medicine and at the University of Pennsylvania Medical School. He has served as an adjunct professor at UCSD School of Medicine and SDSU. Jennifer A. Doudna, PhD, Professor of Molecular and Cell Biology and Chemistry at the University of California, Berkeley and Howard Hughes Medical Institute investigator, has devoted her scientific career to revealing the secret life of RNA. Using the approaches of structural biology and biochemistry, Doudna’s work deciphering the molecular structure of RNA enzymes and other functional RNAs has shown how these seemingly simple molecules can carry out complex functions and can work together with proteins to control the information content of a cell. Doudna grew up amidst the natural wonders of Hawaii, where she experienced volcanic eruptions, explored remote beaches and honed her body-surfing skills while living in the small town of Hilo on the Big Island. Doudna earned a BA in biochemistry at Pomona College in 1985, where she worked with outstanding chemists Sharon Panasenko and Fred Grieman, and enjoyed the mentorship of many other great professors. She then worked with Jack Szostak at Harvard, completing her PhD in 1989 on the develpoment of a self-replicating RNA based on the activity of a group I self-splicing intron. This work showed how RNA could function as both a template and a catalyst for generating copies of itself, a key propoerty of life. As a Lucille Markey postdoctoral associate with Tom Cech at University of Colorado at Boulder, Doudna began crystallizing catalytic RNA molecules with a goal of determining their three-dimensioanl structures and hence inlocking the key to their biochemical activities. She continued this work as a faculty member at Yale University, where she became a professor in 1994 in the Department of Molecular Biophysics and Biochemistry. In two landmark studies early in her career, Doudna and colleagues solved the crystal structures of two large RNAs – the P4-P6 domain of the Tetrahymena thermophila group I intron ribozyme and the hepatitis delta virus ribozyme. By determining their molecular structures, her work advanced the understanding of RNA’s ability to function as a catalyst in biological systems. In 2002, Doudna moved to the University of California at Berkeley, where her lab began studying the function of small RNAs that control the use of a cell’s genetic information. This led to her work on bacterial immune systems that employ RNA molecules derived from viruses to target and destroy foreign DNA. In collaboration with the lab of Emmanuelle Charpentier, Doudna and postdoctoral associate Martin Jinek discovered the function of an RNA-guided enzyme in the bacterial immune pathway, Cas9, whose ability to cut double-stranded DNA can be programmed by changing the guide RNA sequence. They recognized that such an activity could be employed as a molecular tool for precision genome engineering in various kinds of cells, a discovery that has triggered a revolution in the fields of molecular genetics and genomics. Doudna’s work has been honored by numerous awards. She received the National Academy of Sciences Award for Initiatives in Research in 1999, and the Alan T. Waterman Award from the NSF in 2000. In 2001 she received the Eli Lilley Award in Biological Chemistry from the American Chemical Society, and in 2013 she was the recipient of the Mildred Cohn Award from ASBMB and the Hans Neurath Award from the Protein Society. She has been a Howard Hughes Medical Institute investigator since 1997 and a member of the National Academy of Sciences since 2002. She was named to the American Academy of Arts and Sciences in 2003 and elected to the Institute of Medicine in 2010. In 2014 she received the Lurie Prize from the Foundation for the NIH. Jeannie T. Lee is an Investigator of the Howard Hughes Medical Institute and Professor of Genetics (and Pathology) at Harvard Medical School and the Massachusetts General Hospital (MGH). She is also the Scientific Founder of RaNA Therapeutics, a company that harnesses the potential of long noncoding RNAs to treat disease. Dr. Lee specializes in the study of epigenetic regulation by long noncoding RNAs (lncRNA). Using X-chromosome inactivation (XCI) as a model, her laboratory has made several contributions to our understanding of RNA-directed chromatin change, including the role of RNA in targeting Polycomb complexes and the mechanisms of repression by antisense RNA. She received her BA in biochemistry and molecular biology from Harvard University, where she worked on antisense repression of transposition with Nancy Kleckner. She obtained MD-PhD degrees from the University of Pennsylvania School of Medicine, where she studied epigenetic regulation of X-linked diseases with Robert L. Nussbaum. At the Whitehead Institute/MIT, her postdoctoral work with Rudolf Jaenisch delineated the X-inactivation center. She has served as Chief Resident of Clinical Pathology at MGH, and received both the Basil O’Connor Scholar Award (March of Dimes) and the Pew Scholars Award (Pew Foundation) as a young investigator. Dr. Lee has been awarded a Distinguished Graduate Award of the University of Pennsylvania School of Medicine, and currently holds a MERIT Award from the NIH. She is also the recipient of the 2010 Molecular Biology Prize from the National Academy of Sciences, U.S.A, is a Fellow of the American Association for the Advancement of Science (AAAS), and has served on the Board of Directors for the Genetics Society of America. Scott W. Lowe is a Member of the Cancer Biology and Genetics Program at Memorial Sloan Kettering Cancer Center (MSKCC) in New York City where he serves as the Associate Director for Basic Cancer Research. He is also Chair of the Geoffrey Beene Cancer Research Center and an Investigator for the Howard Hughes Medical Institute. Dr. Lowe received a Bachelor of Science Degree from the University of Wisconsin-Madison where he worked for several years studying the molecular basis of hypercholesterolemia. He performed his graduate studies at the Massachusetts Institute of Technology under the supervision of Dr. H. Earl Ruley, and received his PhD. for research on the role of the p53 tumor suppressor in oncogenic transformation, apoptosis, and chemosensitivity. After a brief postdoctoral position in the MIT Center for Cancer Research with Drs. David Housman and Tyler Jacks, Dr. Lowe initiated independent research at Cold Spring Harbor Laboratory as a Cold Spring Harbor Laboratory Fellow and then as a member of the faculty. Dr. Lowe’s research has made important contributions to our understanding of the p53 tumor suppressor network, as well as the processes of multi-step carcinogenesis, cellular senescence, and tumor-cell drug resistance. Current research is based on the premise that the path of cancer evolution dictates a tumor’s subsequent response to therapy and creates unique vulnerabilities that represent therapeutic opportunities. Hence, the laboratory applies mouse models, RNA interference and cancer genomics in a coordinated effort to identify cancer drivers and dependencies that will be useful therapeutic targets relevant to specific cancer genotypes. Dr. Lowe’s work has been recognized by several awards, including a Sydney Kimmel Foundation Scholar Award, a Rita Allen Foundation Scholar Award, the AACR Outstanding Investigator Award, the Paul Marks Prize for Cancer Research, the Kunio Yagi Medal, and the Alfred G. Knudsen Award. He also has been inducted as a Fellow in the American Academy of Arts and Sciences. Since 2002, John Maraganore has served as the CEO and a Director of Alnylam Pharmaceuticals, a leading RNAi therapeutics company. Prior to Alnylam he served as an ofﬁcer and a member of the management team for Millennium Pharmaceuticals, Inc. As Senior Vice President, Strategic Product Development for Millennium, he was responsible for the company’s product franchises in Oncology, Cardiovascular, Inﬂammation and Metabolic Diseases. He was previously Vice President, Strategic Planning and M&A and prior to that he was General Manager of Millennium BioTherapeutics, Inc., a former subsidiary of Millennium. Before Millennium he served as Director of Molecular Biology and Director of Market and Business Development at Biogen, Inc. At Biogen, Dr. Maraganore invented and led the discovery and development of AngiomaxTM (bivalirudin for injection, formerly HirulogTM) currently marketed by The Medicines Company. Prior to Biogen, Dr. Maraganore was a scientist at ZymoGenetics, Inc., and the Upjohn Company. Dr. Maraganore received his MS and PhD in biochemistry and molecular biology at the University of Chicago. Dr. Maraganore is a Director for Regulus Therapeutics, Agios Pharmaceuticals, bluebird bio, and Tempero Pharmaceuticals. He also serves as a Venture Partner with Third Rock Ventures. Dr. Maraganore is a member of the Biotechnology Industry Organization (BIO) Board and the BIO Executive Committee, and serves as the vice-chair of the Emerging Company Section and as co-chair of the Regulatory Environment Committee. Dr. Joshua Mendell attained his undergraduate degree in Biology at Cornell University in 1996 and completed an MD-PhD degree at Johns Hopkins in 2003. In 2004, Dr. Mendell established a research group at Johns Hopkins focused on the post-transcriptional regulation of gene expression and the roles of such pathways in normal physiology and in diseases such as cancer. In particular, the Mendell laboratory has devoted significant effort towards elucidating functions of the microRNA (miRNA) pathway. Dr. Mendell’s research group provided one of the first demonstrations that miRNAs are functional components of critical oncogenic and tumor suppressor pathways and that miRNAs represent potent and non-toxic anti-cancer therapeutic agents when delivered systemically. Dr. Mendell has been the recipient of several awards including being named the Outstanding Young Scientist in the State of Maryland in 2007 and a HHMI Early Career Scientist in 2009. In 2010, Dr. Mendell received the AACR Award for Outstanding Achievement in Cancer Research. In 2011, Dr. Mendell received a Rising Stars Award from the Cancer Prevention and Research Institute of Texas and relocated his laboratory to UT Southwestern Medical Center in Dallas. Phillip A. Sharp is Institute Professor (highest academic rank) at the Massachusetts Institute of Technology and member of the Department of Biology and the Koch Institute for Integrative Cancer Research. He joined the Center for Cancer Research (now the Koch Institute) in 1974 and served as its director for six years, from 1985 to 1991, before taking over as head of the Department of Biology, a position he held for the next eight years. More recently, he was founding director of the McGovern Institute, a position he held from 2000 to 2004. His research interests have centered on the molecular biology of gene expression relevant to cancer and the mechanisms of RNA splicing. His landmark work in 1977 provided the first indications of “discontinuous genes” in mammalian cells. The discovery fundamentally changed scientists’ understanding of gene structure and earned Dr. Sharp the 1993 Nobel Prize in Physiology or Medicine. Dr. Sharp has authored over 400 papers. He is an elected member of the National Academy of Sciences, the Institute of Medicine, the American Academy of Arts and Sciences, the American Philosophical Society, and the Royal Society, UK. Among his many awards are the Gairdner Foundation International Award, the Lasker Basic Medical Research Award and the National Medal of Science. His long list of service includes the presidency of the AAAS (2013) and Chair of the Scientific Advisory Committee, SU2C Project, AACR. A native of Kentucky, Dr. Sharp earned a BA degree from Union College, Barbourville, KY, and a PhD in chemistry from the University of Illinois, Champaign-Urbana. Dr. Sharp is a co-founder of Biogen (now Biogen Idec) and Alnylam Pharmaceuticals Inc.